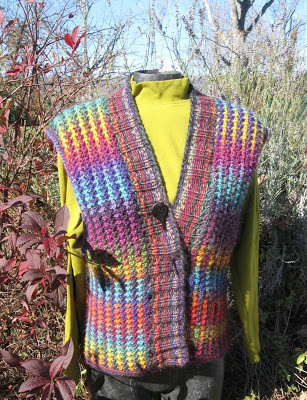 Poetry in Motion vest by Deby Lake for Universal Yarn. It's hard to put down a soft, fluffy yarn with a sumptuous color palette and so many possibilities! While working with Poems Chunky yarn in my Short Row knitting workshop, I couldn't help but delve into another project with this lovely, chunky weight yarn. 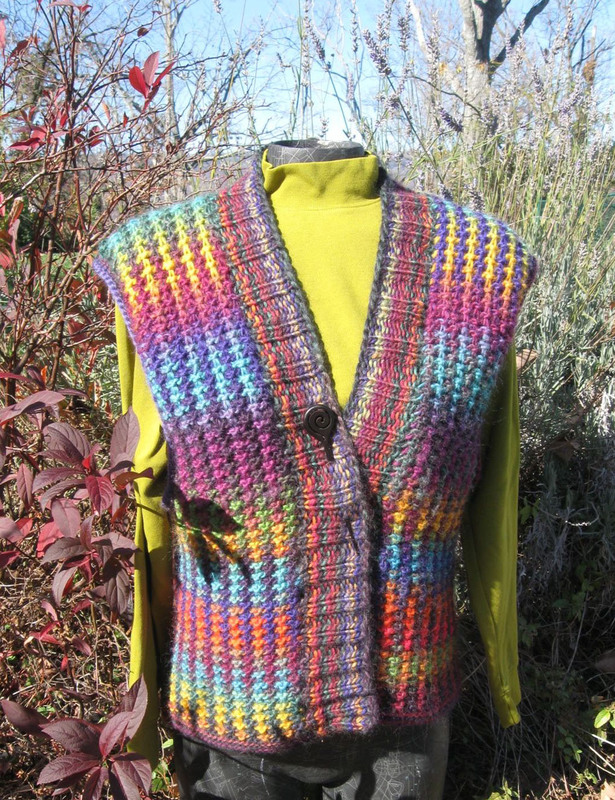 This is the Poetry in Motion vest, designed by Deby Lake for Universal Yarn. It is knit in one piece and the construction doesn't interrupt the rhythm you get into while knitting the eaily-memorized slip stitch pattern. It allows you to enjoy the anticipation of the next color that will flow from the ball of yarn, up through your fingers and onto your needles. 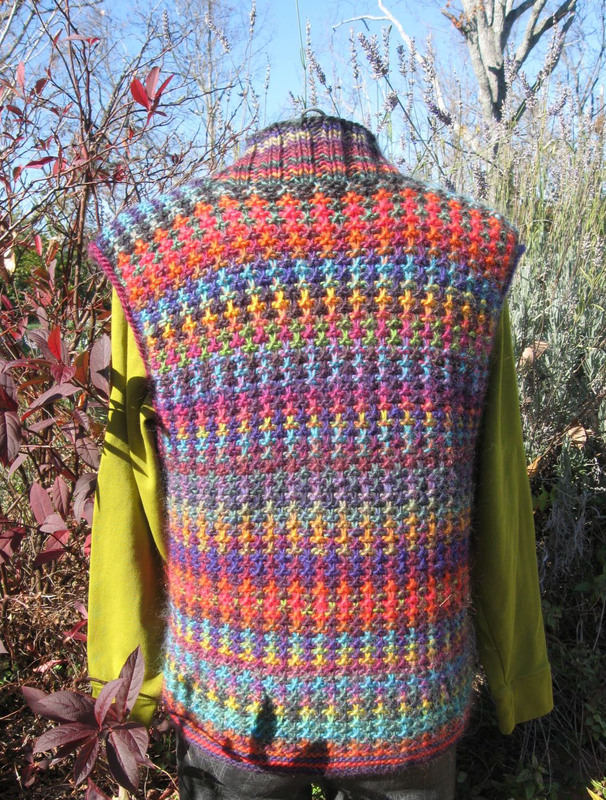 Poetry in Motion vest (back view). Construction is simple: starting at the vest's lower back hem, you knit up to the neck and continue over each shoulder to knit the left and right fronts. Finishing is minimal: the sides are the only seams. (How easy is that??) The armhole trims and a ribbed collar are knitted additions. I used Ultraviolet for CC1 and Reverie (with leftover bits from Sunken Treasure) as the CC2 color. Because of this color combination, I can wear mine with 5 different tops—each a different color. Any of Poems Chunky's beautiful colorways should knit up just as captivating. (See the Old World Plum/Mantra combo on the pattern (left).) With the long color change of this yarn, you might even be able to use all the same color but start at different places in the balls. Swatch it and see! So many possibilities! Relax and enjoy the color parade! And, let me know if you try this project.